If you were to tell me a year ago I would be working as an aircraft deicer in Indianapolis, I would not have believed it. Deicing aircraft has been an eye opening experience. I’m working part-time as an aircraft deicing sprayer and who knows what this will lead to next? First of all, deicing is something we don’t even think about in Australian aviation. I am not even sure if there is any proper deicing equipment at Melbourne International airport? Nor was it an issue when I was flight planning and dispatching flights to or from Australia. Working as an aircraft deicer is great fun. Sure it’s cold, but that goes without saying, after all that’s why the job exists. 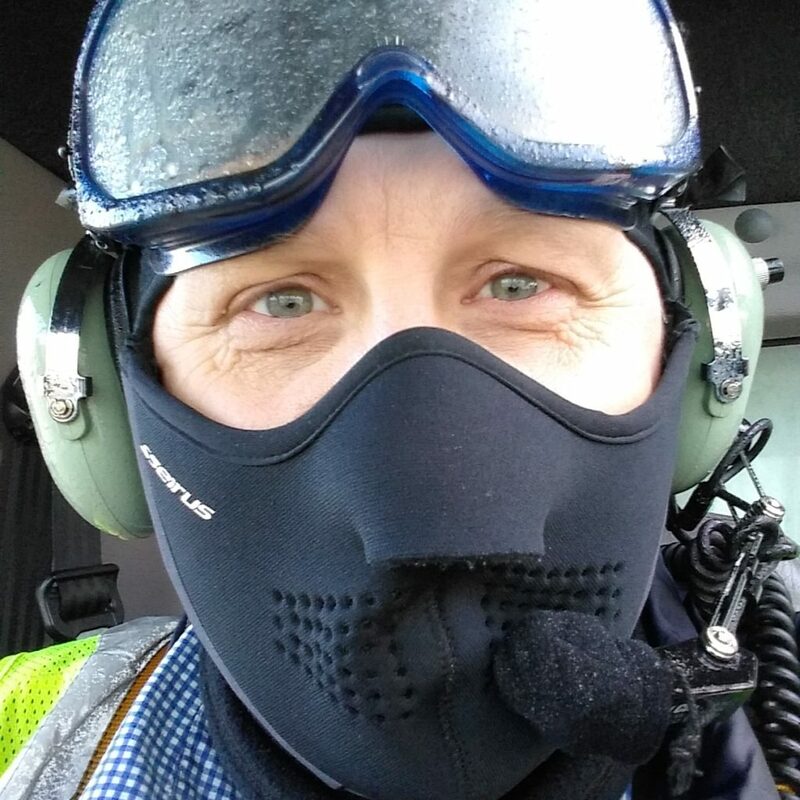 As long as you dress properly for the job, the cold weather is fine. So far the coldest I have experience is -9 degrees C (16 Degrees F). When an aircraft remains overnight (RON), its outer surface has time to cool down below freezing and accumulate atmospheric moisture and precipitation. This is what creates problems for first flights of the day. If the first flights of the day are late, so too are the later flights that same aircraft are scheduled to do. Therefore it is important to get the first flights out and deiced as quickly and efficiently as possible. The face mask protects from the cold and fluid spray. Headsets are used to communicate with the driver. 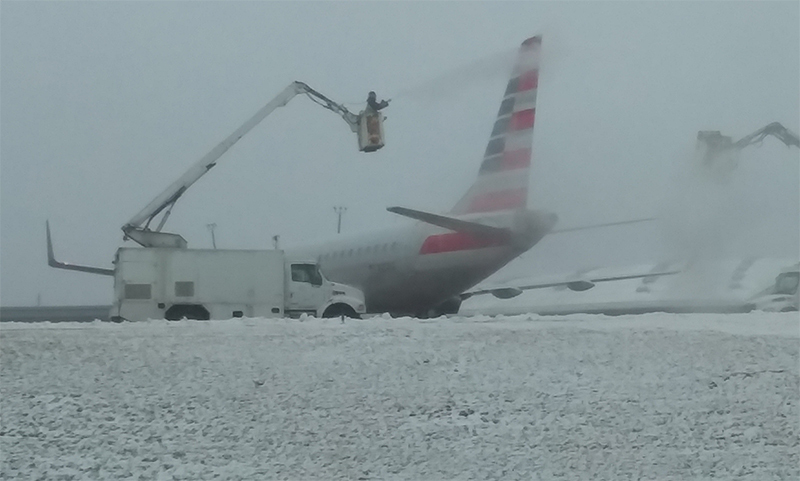 A quick note for those who are not familiar with aircraft deicing in the United States, two types of fluid are used. Type 1 fluid, which is orange in color, is used to deice or remove any ice, frost or snow from the aircraft. Type 4 fluid, which is green in color, is an anti-icing fluid. It prevents any additional accumulation of precipitation while the aircraft taxis towards the active runway for take-off. Type 1 is always applied first, followed by Type 4 if it is needed. “Anti-icing fluids are designed so that most of the fluid will flow off the aircraft by the time the aircraft reaches rotation speed; consequently, they provide no icing protection once the aircraft is airborne.” While in flight, aircraft are protected from ice accumulation by the anti-icing or de-icing systems onboard. When we spray deicing fluid on an aircraft, it is hot water mixed with Type 1 fluid. The mixture ratio can vary, but typically it is usually a 50% water and 50% Type 1 fluid. The water is heated to a very warm temperature, which is what causes all of the steam when spraying an aircraft. Often you have to stop spraying for a moment, wait for the steam to clear to observe the sprayed area. Recently, some of the aircraft that have remained overnight, the surface temperatures fell below freezing, then snow and ice accumulated. My initial thoughts were, no worries, removing snow and ice will be like a hot knife through butter. Wrong Wrong Wrong!! Despite the high Type 1 fluid mix temperature and a relatively high pressure spray, the snow and ice refused to budge. I can assure you, some snow and ice is stubborn and refuses to move. I was gob smacked! If your flying somewhere and deicing is taking a long time, there is a good chance the snow and ice is being very stubborn. Be patient, they will get it done. When the snow and ice refuses to budge, we have not choice but to keep on spraying until it is all removed. Things such as wind can make it more difficult. It only takes as little as 5 – 8 knots of wind to greatly reduce the range of the spray. If you work on the ramp and do pushbacks where deicing takes place near the gate, please try to keep in mind the direction you park the aircraft for deicing if possible. I always find it easier if the aircraft is facing into the wind and I have my back to the wind when spraying. That way the wind helps carry the fluid on to the wing, instead of fighting a headwind or crosswind, reducing the spray range. Although we operate from adjustable open buckets, it takes additional time to have to readjust the bucket to counter the winds. Spraying a B737 from an open bucket. With the amount of snow and ice that sometimes falls off the wings during deicing, its actually dangerous to walk underneath the aircraft during deicing. Several deicers have reported large sheets of ice sliding off wing and tail sections dropping down to the surface smashing into pieces. Keep in mind, Airbus and Boeing tail sections are quite high off the ground. You would be amazed how high the T-tail sections are on some aircraft. Is it worth doing as a job, absolutely for sure, it’s a great experience. However it is not a permanent career move, as it’s obviously a seasonal position. If you enjoy being around aircraft and want to learn more about aviation, it is an ideal and unique opportunity. Like most airline positions, the hours are long, they start very early and sometimes end quite late due to delays. That’s the airline lifestyle I have come to know and love. After working in the airline industry, I cannot go back to working in an office environment. The view you get from spraying the aircraft is an amazing sight very few people get to see. I don’t have any photos, as time does not allow me to stop and take photos. In case you were wondering, we can see inside the passenger windows on aircraft. I have not seen anything unusual yet, as I am more focused on inspecting the aircraft wings, fuselage and tail sections for snow and ice. I am not surprised by what other deice sprayers have seen going on inside aircraft windows so far and I have only been doing this job for a short period of time.